Yamaha CP-1 Stage Piano The Yamaha CP1's design is an elegant blend of tradition and innovation with attention to detail and quality in eve.. The Yamaha CP1's design is an elegant blend of tradition and innovation with attention to detail and quality in every component. Providing the ultimate in acoustic and vintage electric piano touch and tone, the CP1 is Yamaha's flagship designed for the demanding pro. Each individual part of the CP1 was specifically designed to reflect Yamaha's commitment to making a timeless instrument with lasting value. The classic wooden side panels and the vintage textured top call up memories of legendary keyboards of the past. The brilliant vacuum florescent display, brushed aluminum volume knob and lighted Yamaha logo reflect the state–of–the–art, cutting edge technology under the hood. The knobs, switches and intuitive user interface are all laid out for optimum ease of use in performance. All these design elements come together to make a stunning visual statement on stage. This excellent piano is currently on special offer, at an all-time low price, so don't be caught short and get yours ordered today! For queries regarding our range of finance and delivery options available for this piano, please contact our sales team directly. New SCM (Spectral Component Modeling) tone generating system. 17 selected acoustic and vintage electric piano sounds. New NW–STAGE wooden weighted keyboard. 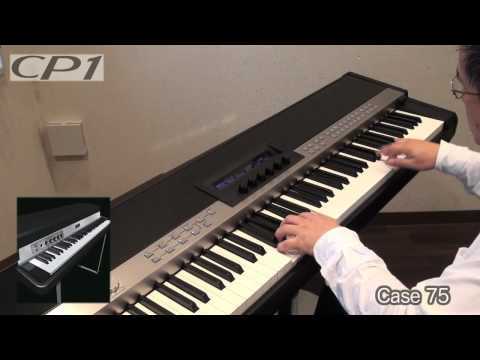 Customize function to create your original piano sound. User interface specialized for live stage performance. Pedal Unit (Sustain, Sostenuto, Soft) included.